Jim Ervin (left) hopes that Ballymena United can continue their recent run of form, which included Saturday's win at Coleraine, in the remaining games of the season. Picture: Pacemaker Press. Jim Ervin says Ballymena United’s players are determined to reward the loyalty of the club’s supporters with a strong finish to the season. 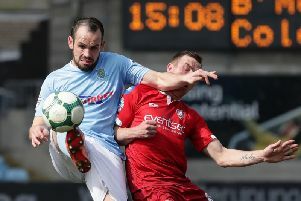 The experienced full-back paid tribute to the fans who cheered the Sky Blues to victory in Saturday’s 1-0 win at Coleraine, while United recorded a third straight league success with the midweek win over Warrenpoint Town. “The crowd that was at Coleraine was fantastic, particularly when you consider the travelling we’ve had to do in recent weeks,” said Ervin, who has been handed the captain’s armband in recent weeks. “I think we’ve been a bit unfortunate in terms of the way the fixtures fell - that’s three Saturdays in a row away to Ballinamallard, Coleraine and Institute. “It’s not easy for supporters to be out of pocket to travel to matches and organise buses before they even pay to get into the game. For a player who has spent most of his Irish League career at the sharp end of league title challenges with Linfield, Ervin admits that games in the lower half aren’t an appealing thought in the latter weeks of the season. “I’m not going to lie, it’s frustrating. As a club we don’t want to be there, we want to be in the top six and we’re disappointed we haven’t got there this season. “We had given ourselves a really good chance, particularly after the good start we made to the season but we had a lot of injuries and suspensions, although we’re not using that as an excuse. “We have a big squad with a lot of Irish League experience so we should know better than some of the things we’ve done. “It’s hard when you’re coming to grounds and there’s no real atmosphere but Saturday was different because it was a ‘derby’ game. “We finished seventh last year and we don’t want to drop away from that. “If we finish seventh, we will finish above Coleraine which would be a boost for the supporters. “We set our target after the Irish Cup semi-final of winning all of our remaining six games. “In my opinion, if you’re a footballer and you don’t set yourself targets, you shouldn’t really be playing. “We’re all professionals and we all want to do our best. “If you don’t set yourself a target, whether it be each week or in the long term, there’s no point in being in the game and Glenn, Norman and Doc have made it very clear what targets they want to meet and if we don’t do it as players, we’ll not be at the club,” added Jim.